Here’s the new 60 Watt equivalent bulb from Philips or what some might call the Holy Grail of LED light bulbs! This is because with an 800 Lumen light output and a 2700K color temp, its a dead ringer for an incandescent bulb. Drawing a mere 12W, these are fully dimmable too and cost $40 at Home Depot. 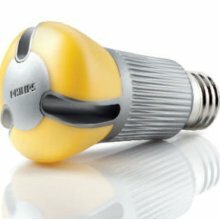 Philips claims a 25,000 hour lifespan which is six years if they are lit for about 12 hours per day. This means that each one can save a total of $150 vs. their incandescent counterparts at current electric rates. They pretty much work as advertised too, emitting a soft white glow when lit that looks just like a 60W light bulb. Don’t let the yellow color in the picture fool you either, since that color disappears completely when lit. Another plus is the fact that these bulbs throw off light in all directions which makes them perfect for table lamps. So, I bought three of these over a one week time period and I have to say that with each new addition, my tree hugging side grew happier and happier. However, when I plugged in the third, that little bit of eco-bliss quickly disapated as I discovered the downside to these otherwise magnificent bulbs. The dimmable wall switch that controlled all of them suddenly went completely haywire on any setting less than full brightness. Lighting levels varied randomly and often from dim to full for no apparent reason. Now my house is wired with Simply Automated US11-30 UPB wall switches. These aren’t the most current generation that SAI makes, so newer switches may compensate for this issue. In my case, adding a 2W incandescent nightlight to the switched circuit improved but didn’t totally eliminate the problem. Now, dimming works well but occasionally the lights still flicker a bit. I’m still working on the final fix, but for the record, this is a known issue with LED bulbs and traditional dimmers since their extremely low current draw can cause these devices to behave erratically. Hopefully, dimmer manufacturers are aware of this and are developing switches that don’t have the issue. Heck, maybe I’ll try one of SAI’s newer US1140 wall switches to see if it fully corrects my problem.